Sometimes my friends just offer me a budget, tell me they need something for a room in their house, and tell me to make them anything. I’m very lucky to have such supportive friends, especially when the pay is fair. Such was the case here. Following a rant of mine about people not wanting to pay for my time or goods, Brota and Angela allowed me to go nuts on some pieces for a room in their lovely home. With that much creative freedom, I often hit a bit of a creative block, but if I’m patient and diligent, that idea I’m looking for will eventually come to me. 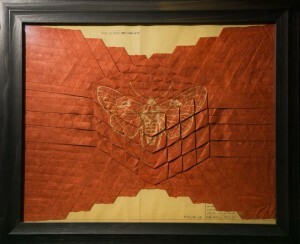 I have to form an overall idea of there a thing is going, which includes from what paper it will be folded. I had recently explored an abandoned school with a dear friend and procured some blueprints and cyanotypes that were very old, slightly moldy in parts, but well-preserved from the excess moisture in the building. Because of what they’re made with (and given their age), they smelled quite bad and burned my eyes while I folded them. 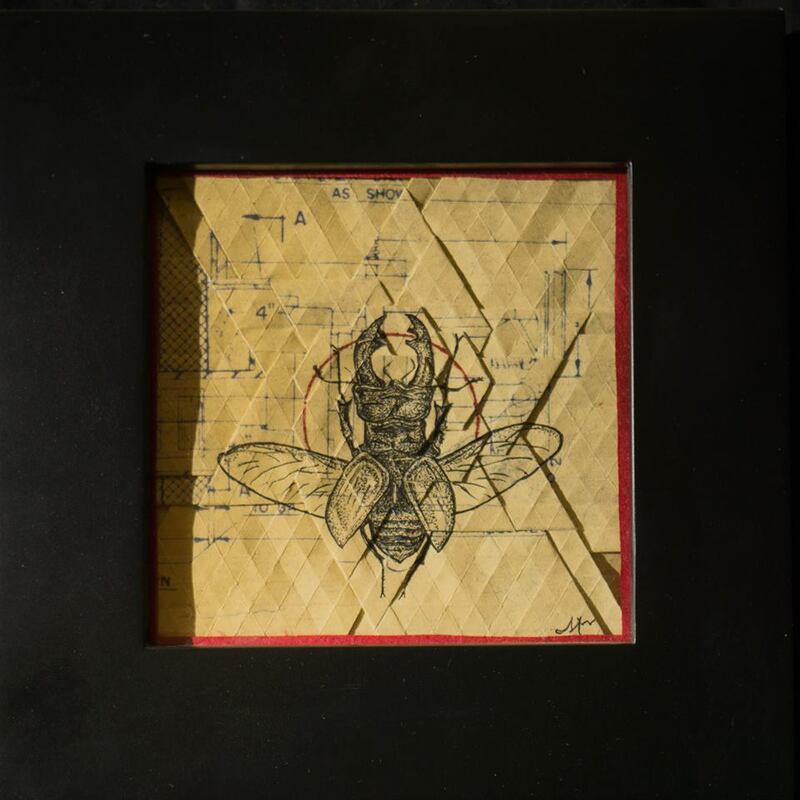 After folding, I gathered some favorite pens and illustrated the finished tessellations with various insect diagrams. My color choices were based on the color of the wall on which they will reside, as well as other images of things they shared with me of art that they liked. I decided on red, black, and gold primarily and included 1955 cyanotypes in each to keep it a cohesive set. 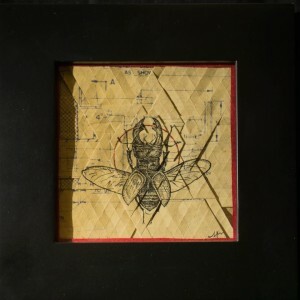 The first is a bee, approximately 10″ in a hexagonal frame. 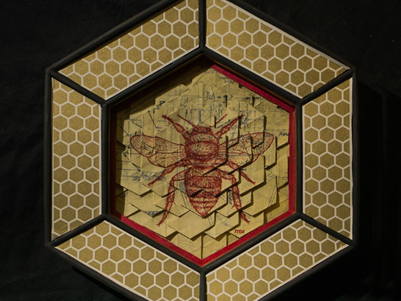 I have a strange obsession with hexagons. 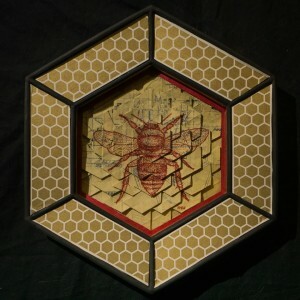 Bees create hexagons in nature, which only further fascinates me, as it shows some truth in sacred geometry. 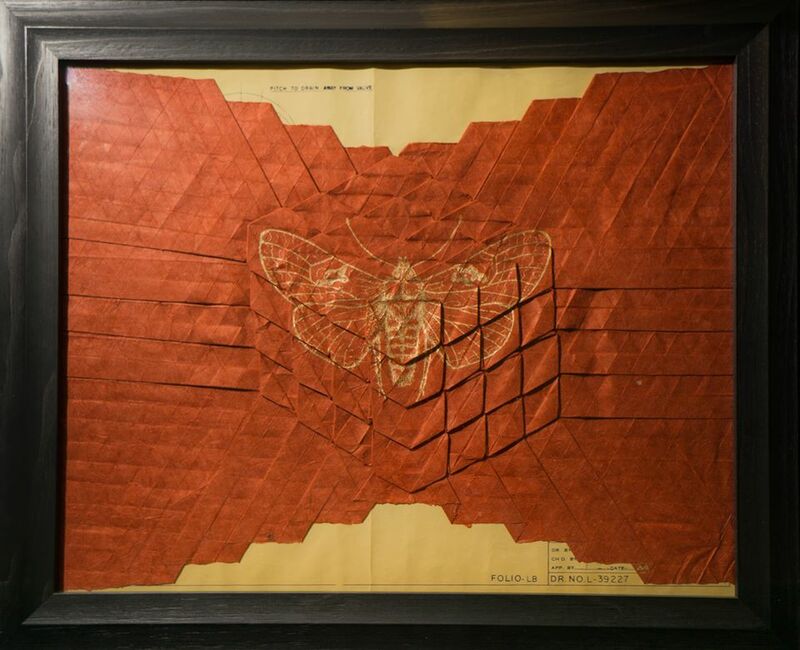 The second one I made was this moth in a 16 by 20 inch frame. This was as I was getting over the hurdle of that creative block. 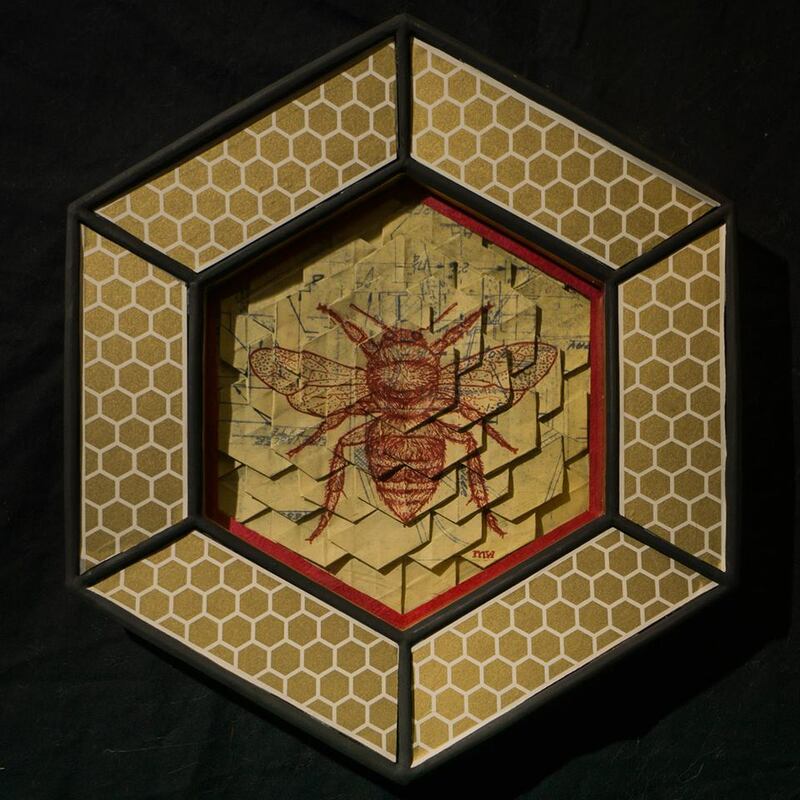 After making the frame for the bee, I felt it hard to come up with anything along the same lines. I used a metallic gold pen. The third is a stag beetle and has an image area of only 5 inches. My initial thought was to “fold one more tiny piece real quick.” The illustration wound up taking the longest of the three somehow, and the finished piece may be my absolute favorite (and I’m glad it doesn’t look like just an afterthought now). I’m really excited with how the whole trifecta turned out, and it was fun to present them with the finished surprise.